To get this look, I used a CC cream from It Cosmetics that I got as a sample at Sephora (didn't hate it, but didn't love it); then used Nyx's Bright Idea Illuminating Stick in Coralicious on my cheeks. Lips are ColourPop's Lippie Stix in Scandy covered by Ulta's Juice Infused Lip Oil in Coconut. The eyes are really where I spent time for this look: Brows are shaped with Ardell's Brow Sculpting Gel in Clear. Along my brow bone and in the corners of my eyes, I used Thrive Causemetics' Brilliant Eye Brightener. On my lid, to the crease, is Maybelline's Color Tattoo Eye Chrome (a liquid eye shadow) in Bold Sapphire. (Between this product and Nyx's Lid Lingerie, which I've mentioned previously, I prefer Nyx's, which goes on more easily.) 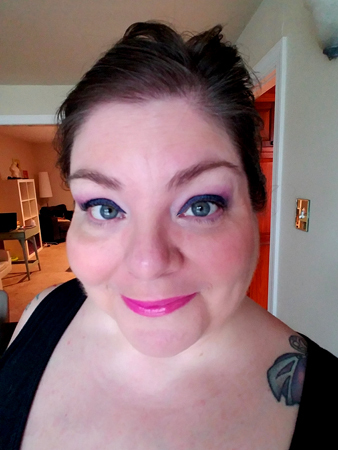 In the crease is a powder eye shadow, Urban Decay's Haight, which serves to transition up into the pink poweder eye shadow, Sephora's Colorful Fresh Paint No. 317. And then I finished my brushing my lashes with Thrive's Liquid Lash Extensions. One of the things that has helped me so much with eye make-up application has been springing for a decent brush. Now that I understand (in my 40s, lol!) which brushes are best for which purpose, and spent a very modest amount on brushes instead of using whatever flimsy, free applicator I had lying around, it's like a whole new world!